Raymond Laser's laser rust cleaning machine is a new generation of surface cleaning and high-tech products. It is easy to install, operate and automate. When the machine is powered on and turned on, you do not need to add any chemicals, dust, water, or media to clean it. This automation laser rust removal machine can not only remove surface resin, stains, grease, dirt, coating, etc., but also auto focus. Application Area: this kind of laser rust removal machine is widely applied in mold industry, automobile manufacturing, shipbuilding industry, food processing, sewage treatment, rubber tires, petrochemical and other industries. Application Scope: this laser cleaning rust machine can quickly remove paint and remove metal or glass surface coating, rust, and a variety of oxides, grease, resin, glue, dust, stains, production residues, rough metal surface. 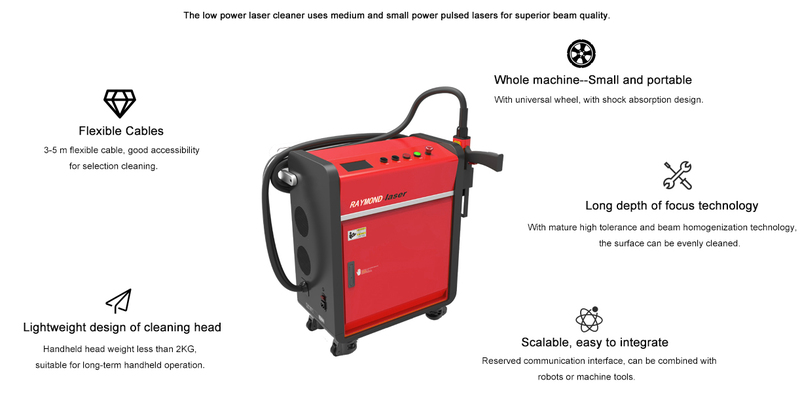 laser The cleaning rust machine can also remove the greasy dirt, Post-weld oxide and dispose of the residue before welding. Mould cleaning,such as tire mould, electronic mould, food mould. Greasy dirt of the precision parts can be removed after production and processing. All in all, this laser removal machine can quick cleaning of nuclear component maintenance. 1.Non-contact cleaning without damage to parts matrix. 2.Precision cleaning, the laser removal machine can achieve selective cleaning and precise location . 3.The laser cleaning rust machine can remove rust without any chemical no supplies, cleaning fluid, safety and environmental protection. 4.Simple operation, just turn on the power, the handheld laser rust removal machine can achieve automated cleaning. 5.The cleaning efficiency of this laser removal machine is very high, save time.